Democracy is a fine thing … up to a point – In case you are wondering what this is about, at the Global Water Intelligence event … apparently “during the last session of the conference, 76% of the people in the room voted (using the audience response system) to get [the moderator] to shut up and let them leave. The panel had 15 minutes left to run.” Our panel session in Hong Kong, on the other hand, overran by 15 minutes, eating into “networking drinks”. So this comment works both ways! I gave three talks that week: one at the 2oC+ Water forum, another at the American Chamber of Commerce and the last to a family office. What struck me was that participants seemed to find the presentation insightful but sobering. So why is it only sobering now? This is not new data, new information to companies or investors with experience in China. The reality is, you don’t appreciate the risks until you see the extent of the water crisis, how everything is interlinked, how little room there is to maneuver as water resources shrink with no thanks to climate change against rising water consumption with affluence. In other words, once you ‘get it’ you sober up. Here’s the problem: water scarcity limits climate change solutions like hydropower, nuclear power, food crop generated biofuels and carbon capture and storage technologies. And climate change limits water solutions like desalination, which is currently carbon intensive. (Note the word “currently” – because apparently new materials/ synthetic genomics will save us all in the future). So in the world of 2oC+ Water, being a large energy user AND in a region that is water scarce is not where you would want to be. China is both of these. Climate change exacerbates water scarcity – water resources are falling and water utilization ratios are on the rise. These trends are worrying and expected to continue with climate change and population growth. Anyway, it doesn’t matter if you don’t believe in climate change, the Chinese government does and has put in place central policies to address this and water, bringing me to the next point. Yes, enforcement of environmental laws historically has been weak in China. Yes, there are water usage quotas by industries in some regions, but they are not enforced. However, we were advised to take heed of the well-known financial research disclaimer, “historical performance is no guarantee of future performance”. All panelists agreed we are at a turning point. Quotas and new pollution targets are now in the Central Plan (12FYP, No.1 Document, 2012 New Water Management Decree). The key word here being “Central”. A comment from a water expert in the audience summarises the transition succinctly: the 11FYP only focused on building water treatment plants; they were built but not used. The 12FYP’s efficiency and pollution targets will make it more difficult to “meet standards by day and discharge by night”. I would like to add here that it is not just the new quotas, it is also the 12FYP’s seven new strategic emerging industries that set the new tone. One of these is “energy saving and environmental protection”. OK, that’s the obvious one but what about, “new materials” and “bio-technology”? There is also this year’s No.1 Document on Agri + Tech. It would appear that China’s way ahead on the, “synthetic genomics will change the world and the water sector” front. Su Liu offers a word of caution here: “the problem is how do we get these policies out of Beijing to reach the grassroot levels of the [local] governments who are actually hands on the water control – now that’s a big challenge”. The NDRC’s signal is clear: Water prices are going to rise and it is not just in water-stressed provinces. Guangdong is the first mover here with tabled progressive use tariff hikes of 45% to 306%. This may seem high but compared to a rise in household income in Guangdong, this increase is still acceptable. These tariff increase plans are currently in public consultation and Su Liu from the Civic Exchange believes that if this does not result in social tension, then they will be enforced and other provinces will follow suit. I have been saying that prices have to rise but it is nice to hear that others believe the same. Investors be warned “of course water prices will rise; those that don’t can believe that at their peril”. Norman Cheng of Veolia Water added that industrial tariffs will rise faster than residential rates. As to whether or not this will erode profit margins, the answer is no, for the industrialists on the panel, as they are already efficient users of water. They noted that higher prices reflect higher water stress and increase social risks, particularly in water-scarce regions. Anderson Lee, the vice-chairman of SFBC highlighted that many may think price hikes will not affect them as they are now using “free” groundwater. However, prohibitions on sinking new wells and excessive groundwater use are now also central directives and so groundwater theft may prove more difficult going forward. With growing competition for water among industry, agriculture and municipal users, there will be a fine balancing act for the government. Central government has been frank about the water crisis and the new central policies will mean there is less wiggle room for provincial governments. At the moment, there is just an overall cap on water usage and not one set for each industry, agricultural and municipal use. But if social tension triggered by water shortages becomes a “hotspot”, central government will react. In this case, Su Liu warns that whilst “business cannot change their practices overnight, [central government] can and will impose policies and controls overnight”. Fear of reputation loss is on the rise for brands and investors as pollution worries and perceived social injustices increase with water scarcity. When water is scarce, not only do social risks abound but public perception is also important. Companies in water-intensive sectors cannot be perceived to be taking away water from the community. F&B is one such sector. Swire Beverages believes that supply chain planning and engaging local government and community is key. Accounting for 75% of the group’s water use, Maureen Lee says the division takes water seriously, committing to reducing, recycling and reusing of water across operations. Anderson Lee pointed out that the work of NGO’s like Greenpeace also has been key in highlighting pollution in the textile sector with their Dirty Laundry reports. Steps are being taken by fast fashion to be green: starting from design to forming an eco-index, the Sustainable Apparel Coalition to brands committing to ZLD and using recycled materials. Although Anderson noted that this is a good start, he questioned whether it would be better to change our lifestyle and shift to “slow fashion” instead. Yes, I think we should! With NGO pressure on the rise in China, this trend is here to stay. 6. More data please: if you don’t know how much water you use, how do you know if it’s a risk? 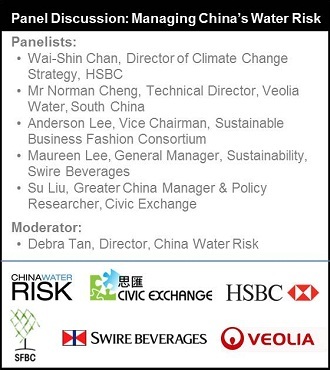 Wai-Shin of HSBC’s presentation was on “What Investors and Businesses Need to Know About Water Risk”. One of the key points here was that investors need to ask the right questions. How can businesses/investors start to quantify the risk, their exposure to price tariff hikes, government quotas and so on, if they have no idea how much water is used in their operations? Laissez-faire enforcement and low tariffs have lulled companies into a false sense of security, but with climate change exacerbating China’s water crisis, it’s time to start asking these basic questions. On the flipside, the companies who are “ahead” on water are bogged down (pun intended) by the many reporting standards and water risk measurement tools available. Many have expressed “questionnaire fatigue”. Investors on the other hand, can’t get enough data and have also complained that the water risk measurement tools are too basic or difficult to use. Basically, they would just like companies to make it easier and present data in a comparable way. OK, we get it, investors love benchmarking; companies want one set of standards. You would have thought that this would be easy but it seems to have taken longer than expected. Perhaps a water crisis and increased risks are not just the winning formula for the water sector but for disclosure as well. Apparently, the hot question is, “do we have an exact map of the water stresses, strains and scarcity and flood prone areas of China with lots of factories overlaid over it?” No. But if someone wants to fund this research, contact us and CWR will make it happen! 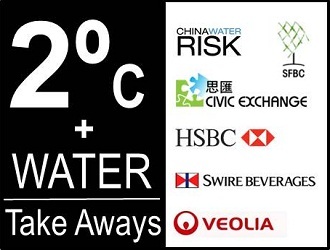 With 70-80% of water in Hong Kong sourced from the Dongjiang River in China and a water agreement that is renewable in 2014, HK is vulnerable. Of course Hong Kong is important to Beijing. That’s not the point. Su Liu of the Civic Exchange believes that “we [in Hong Kong] don’t see the big picture – 40 million compared to our 7 million also rely on the Dongjiang. If water tensions rise on the mainland – where is the priority?”. She has seen first-hand from the field, the stresses that the Dongjiang is under and it is a matter of time until we too will experience a water quota. Why wait for that day? We are more affluent. We have the money/ income to sustain a tariff hike to make solutions like desalination and fully recycled water to potable levels economically viable. We have the same water stresses as Singapore and yet we behave like a child waiting to be fed. There is a water crisis in China, central government is reacting, it is time to grow up. The good news here is that we are resourceful. Water scarcity will push us to look for new solutions/ material substitutes. Anderson hit the nail on the head: it’s all about reallocation. His company, Hong Kong Non-Woven manufactures synthetic fiberfill, which uses significantly less water than down. He pushes this further with recycled synthetics from plastic bottles, reducing not only water but landfill. Swire Beverages is doing the same with packaging. Veolia Water is bullish on wastewater and sludge treatment, recycling water and biofuels to supplement hydropower. There is a minefield of risk but there is also an abundance of opportunity. Winsway: Where are the Water Risks?